Outfielders need to make split second decisions about where to throw the baseball. This article discusses what factors you need to consider so that you’ll be ready to go at game time. 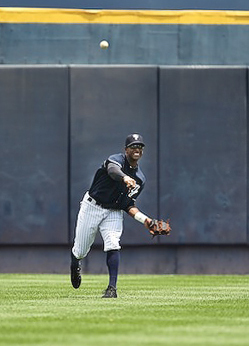 NY Yankee, Greg Golson, throws the ball from outfield. Image by Frank Lauri. 1. The rule of thumb is you should throw 2 bases ahead of where a runner starts. This applies on a ball that you can get to, that doesn’t get past you. No one on, base hit to any outfield spot, the throw would go to 2nd base. Runner at first base, base hit to any outfield spot, the throw would go to third base. Runner at 2nd base, base hit to any outfield spot, the throw would go to home plate. 2. Most of the time, you throw 2 bases ahead of the lead runner. Runner at 1st base, base hit to any outfield spot, the throw would go to third base. Runner at 1st and 2nd base, base hit to any outfield spot, the throw would go to home plate. 3. It is very important to keep your throws low enough that a cut off man can make a play and re direct the ball to another base, if he needs to. This keeps the double play in order, which is always very important. 4. Keeping your throws down will force the runner to make a decision. He is not sure if the cut off man is going to cut the ball or not, and therefore will most likely stay at his base and not try to advance. If he does, the cut off man will cut the ball and take an easy out. 5. Keeping your throws down and using one or two hops to reach your target makes it tougher on the runners but it also gets to your intended target faster than if you were to make high rainbow throw that didn’t bounce. Also, it allows your infielders to make plays on other base runners. 6. With a runner at 1st base and less than two outs, a ball is hit where an outfielder has to move a little to field the ball, he has a decision. Will he make an attempt to get the runner at 3rd or throw it into 2nd and keep the hitter at 1st leaving the double play in order. Base hit to the right fielder, he can come up and throw towards third base. Making sure the ball is low enough so the shortstop can catch the ball, he will ultimately make the decision on what to do with the ball. The shortstop can see the play happening in front of him, so he can either let it go (and fake like he is going to catch it), or catch it and keep the runner at 1st base. If the runner takes too big a turn around first base, the shortstop can cut the ball and back pick him at 1st base. Base hit to the centerfielder, he can come up and make a low throw to third base, again the shortstop makes the decision on whether to let it go or cut it. However, on a ball hit to the centerfielder, it is a much tougher play for the shortstop to see the runner coming around first base so the centerfielder has to know if he has a chance, if he doesn’t, throw the ball into 2nd base and keep the double play in order. Base hit to the left fielder, as you are approaching the ball to make a play, everything is right in front of you to see. If you know you can get the out at third, take it. If you aren’t sure, throw it in to second base. Most of the time if your throw goes to third base the hitter will try to move up to second base, unless he is slow or not a good base runner. Also, keeping the ball low, will help allow your infielders to help you out. 7. With less than 2 outs we want to keep a double play in order. If there are runners at 1st and 2nd base and there is a base hit to any outfielder, the throw will be in the direction of home plate. Keeping the throw down, the infielder will make the decision to let the ball continue traveling home, or to catch the ball and throw it to 3rd, 2nd, or 1st depending on what the other 2 runners are doing. On this play you want to take an out if you can get it, but here we can be less aggressive unless the situation calls for a “must attempt” at 3rd base. It is much better to play it a little cautious and keep the double play in order, than not to get a single out and have runners at 2nd and 3rd. Both of which are in scoring position. Runners at 1st and 2nd and a fly ball is hit to any outfielder, the play if possible is to get the lead out at 3rd base. However, for the runner at 2nd to tag up the ball must be pretty deep. If you don’t think you will get the out at 3rd base, throw it into 2nd. This will keep the double play in order, and keeps the runner at 1st out of scoring position. Runners at 1st and 3rd with a fly ball hit to any outfielder, if there is any chance to get the out at home, make the throw towards home plate. What probably will happen is the runner at 1st will also be tagging up, so keep the ball down and let the cut off man make a decision on what to do with the baseball. If the throw is too high, the runner tagging at first base will be able to walk into second base. If the fly ball is hit too deep to make a play at home plate, throw the ball directly into 2nd base. This again will keep the runner out of scoring position and the double play in order. Bases loaded and a fly ball is hit to any outfielder, he has to make a decision. All the runners, except the runner at 1st base should be tagging up. If you have a shot at the runner at home, take it. If not try to get the runner going into third base. Most of the time the runner at 1st will be half way, and you don’t have to worry about him. Have an idea what you are going to do with the baseball before it is hit to you, but also listen to your fielders close by who should be telling you where to throw the ball. 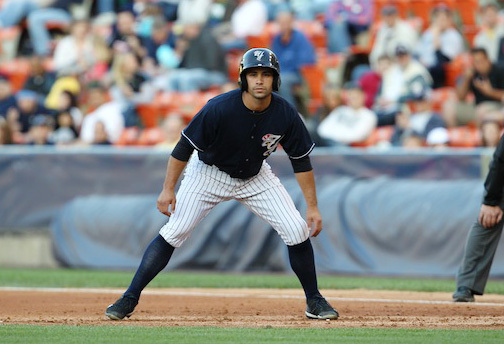 SWB Yankee, Kevin Russo, takes a lead off 1st Base. Image by Frank Lauri. Know if a runner is fast or slow. Has he been aggressive in the past or does he jog around the bases. Knowing this can help your decision making process a lot easier. Most times we have to make split second decisions. Any information we get that can make our decision a little easier is always welcomed. Knowing your runners will help a lot when trying to keep the double plays in order. This is exactly the kind of clear cut instruction that every player should know. Can’t thank you enough for sharing this information.